It seems the natural beauty of this area is inspiring more and more golfers - as Taupo now boasts four courses, two of which have international acclaim. Lush forest, geothermal marvels, rolling hills and mountain ranges and panoramic lake views provide stunning backdrops to your game. New Zealand’s only Jack Nicklaus signature course is just 15 minutes by car from Acacia Cliffs Lodge. This ‘must play’ rolling links course offers stunning views of the lake and beyond with a championship layout to test your skills and give you a truly unforgettable golfing experience. Golf carts and hire clubs are available and your hosts Rick and Linda would be happy to make a booking or arrange partners for your game. Wairakei International Golf Course, rated in the Top 20 courses in the world outside the USA, is a mere 10 minute drive from our luxury lodge. 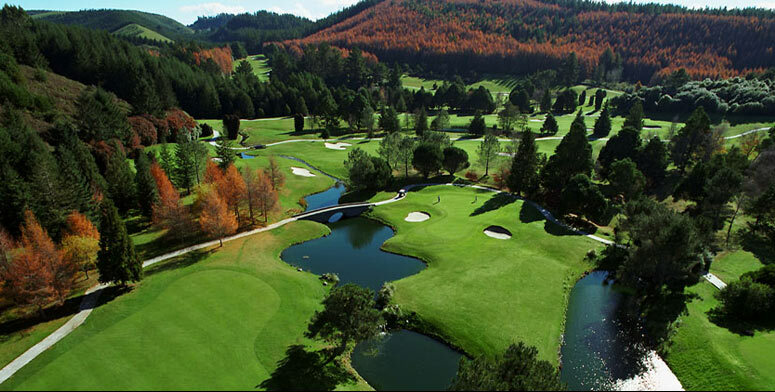 Wairakei International is an 18-hole, Par 72 course nestled in 450 acres of rolling hills and mature trees. 6429 metres of play, 3 water hazards and 108 bunkers await you here along with a superb driving range and resident Pro golfer. At Taupo Golf Club (just 10 minutes by car from Acacia Cliffs Lodge), two very different 18-hole courses are offered. The Centennial Course is an inland links course designed to challenge even the best golfers. Founded in 1973, the Centennial Golf course has 40 bunkers, large greens and long, undulating fairways. The easy-walking Tauhara Course is a pleasure to play with smaller and mostly-elevated greens, steaming earth features and Mount Tauhara’s peak towering above you. Warm up on practise fairways and putting greens. There is also a chipping green and three practise bunkers. A very scenic 40 minutes drive from Acacia Cliffs Lodge, in the lakeside settlement of Turangi, you’ll find Turangi Golf Club. An attractive course, the 18 holes are lined with mature trees that put on a particularly stunning show in Autumn. The reasonably flat course is a Par 72 from both tees. The Club House extends a warm welcome to visiting players year-round.